My students in their American Literature course at Maharishi School are studying American Transcendentalism right now. Keeping with the goals of consciousness-based education, lessons are developed that connect the content of the course with the inner lives of the students. Wholeness: Henry David Thoreau was opposed to the "self-made" materialism of American society. He was more interested in the "self-made" soul than the "self-made" man. Question: What did Thoreau believe lay within one's soul and nature? How did he believe one could be totally free and fulfilled? Answer: He believed divinity lay within one's soul and that if this divinity were developed and given expression, a person could be totally free and fulfilled. 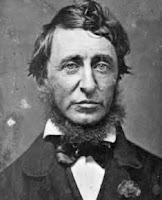 Question: Along with Gandhi and Martin Luther King, Jr., what did Thoreau believe can supercede civil law, and when should it do this? Answer: They all believed that individual conscience supercedes civil law when civil law interferes with a higher moral law. Traits: "Distinguishing and Deciding" (the Vedic qualities of Nyaya) relate to Thoreau because he makes many decisions about what's right or wrong, what the purpose of life is, and how to enjoy life. Traits: "Self-reliance yet caring and helping others" relates to Thoreau because he went out into the woods to live by himself, which was self-reliance, and he also did a lot for freeing slaves, which was helping others. Summary: This video shows the transcendentalist idea of the importance of thought and inner values of life through the actions and writings of Henry David Thoreau. The students listening to presentations were required to take notes; the speakers were required to have posters of the main points of presentation. A lively discussion followed each presentation. I think it was a good, enjoyable learning experience. Thanks to Thomas W. and James F. for their scholarly presentation. For more information on Henry David Thoreau, try The Thoreau Society or The Thoreau Institute.